Hop Kingdom is finally here! After months of searching for venues, lots of hard work building, getting licensed and even a burglary, we are happy to open our doors to the people of London. The skatepark is split across two interconnected railway arches in London Bridge. The first compromises of a 4ft miniramp with a 7ft extension as well as the bar area itself; the second arch is the street section with moveable ledges, rails and mani pads to keep things interesting. Find out more by checking out the Hop Kingdom Page, or following us on Instagram. 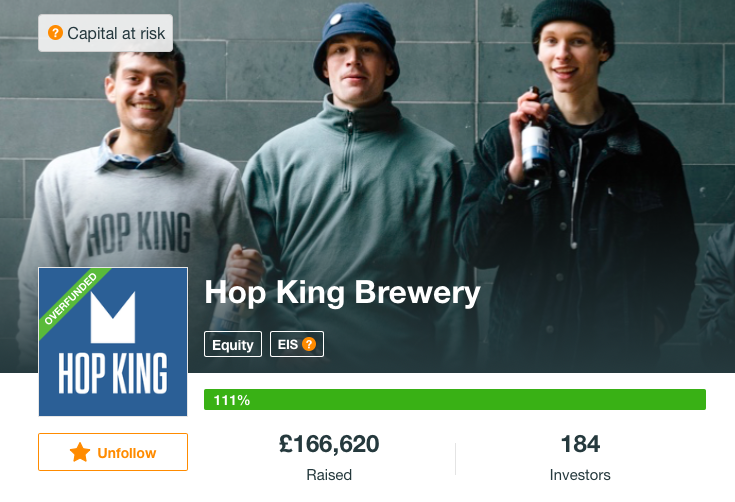 Thank you so much to all those who invested and supported Hop King in our first ever crowd funding raise. It was a stressful few weeks but we ended up over funding by 11% and we can’t wait to grow Hop King into 2019. We are massively humbled by the love and support and really can’t thank you all enough. 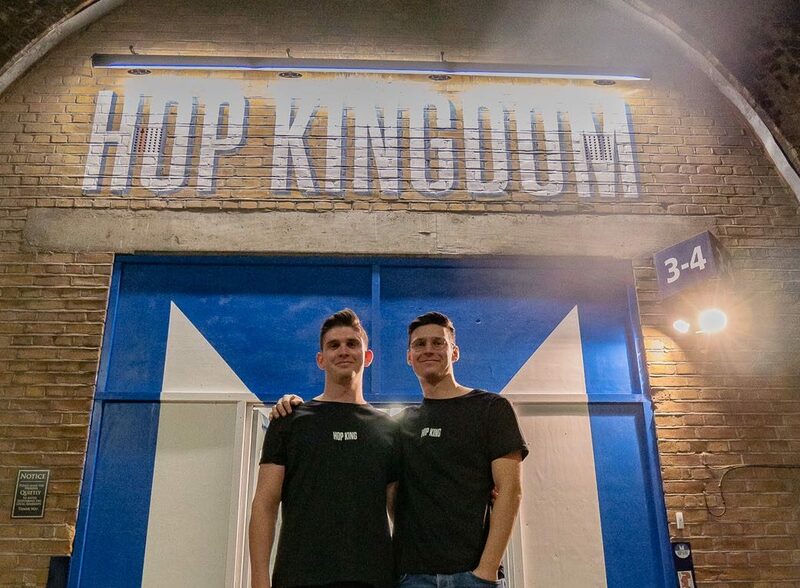 We are now in full search mode for the perfect property for a venue for Hop Kingdom, our brand new London HQ; and are growing our sales team to get the beer out there even more. Keep watching our Instagram to keep up to date with everything Hop King! My brother and I always wanted Hop King to be so much more than a beer. We started, like any other brewery, with the classic merchandise…t-shirts, caps, etc. but with one major difference – we wanted people to actually wear them. In my time running a micro brewery we made some fun looking t-shirts but they were only ever worn by 2 types of people….staff and people at beer festivals. The problem is that they had the word “Brewery” all over them. Let’s face it, as trendy as craft beer is, a brewery t-shirt is basically just advertising to the world that you are, what’s known in the business as, a ‘Beer Geek’ (and this is not a good thing). We just wanted to design some clothes that were cool and understated that people would actually want to wear out. After a few weeks of designing clothes, we found that all our influences lead back to one thing – skateboarding. We were basically creating a skate brand with out realising it. We have always loved skateboarding since Tony Hawks pro skater came out on PS1 back in 99, and although we hung up our skateboards for a number of years, we both follow it very closely. We had a go at designing some decks and whacked them on instagram. 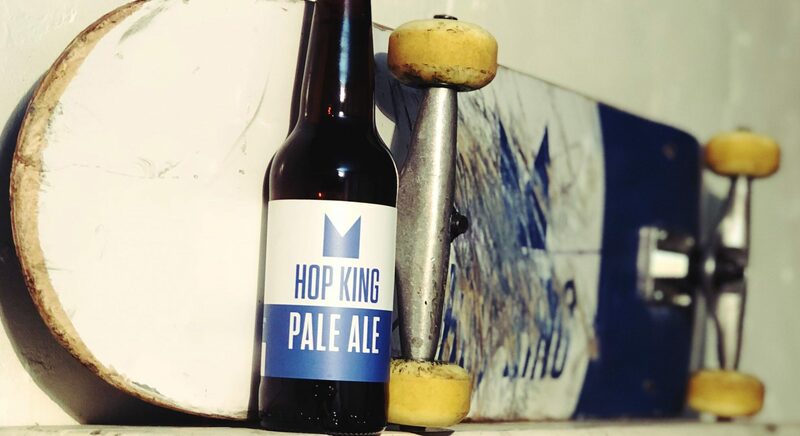 We had such a good response that we decided, then and there, to make Hop King a full on skateboard and beer company! Skateboarding has long been aligned with energy drinks, but never beer. We think this should change. We now have recruited a team of skaters from around the UK with 3 pros and 4 amateurs making up the Hop King Skate Team. We have already done some great stuff with these guys (check out our instagram) but we have so much exciting stuff planned for 2018 that we can’t wait to tell you about….sit tight. Hi, my name is Ben Hopkinson and I am the founder of Hop King. Having spent the last 3 years working in the London craft beer scene, on both the brewing and the pub side, I found a reoccurring problem…accessibility! What I mean by accessibility is craft beer is just too confusing; not everyone knows their double IPA from their Berlinerwiesse or their cask from their keg. Craft breweries have exciting and busy branding with even more weird and wonderful names for all of their different beer styles. This is all great for the craft beer warriors who really take an interest, but for the everyday drinker, craft beer can often be confusing and intimidating. Furthermore, many of the craft beers that I used to drink can very often be too strong, too bitter, or too hoppy for the everyday beer drinker, which is, lest we forget, still the majority of the beer market! In my time running a South East London brewery, our best seller was not our award winning super hoppy 7% beer but our easiest drinking beer – a 3.9% pale ale. I wanted to create an accessible craft beer, that’s easily drinkable, easily recognizable and easily understandable. So I bought myself a 25 litre Home brewing kit and started brewing! The process of creating the Hop King Pale ale recipe was a slow but fascinating process. I started with the most basic ingredients (one variety of malt and one variety of hops) and slowly started experimenting with different hops, malts and yeasts until I had a delicious beer that was smooth, balanced with a bit more mainstream appeal. All I needed now was a brewery! Unfortunately I didn’t have a quarter of a million pounds stuck down the back of the sofa, so I decided to get someone to brew the beer for me. I searched all over the UK and even mainland Europe for the right brewing partner but ended up choosing a brewer in the beer heartland of England….Yorkshire. From tea to puddings, they are so proud of the quality of their produce they put their name on it, and this was good enough for me. Hambleton Ales brewed the first 1500 Litres in August 2017 and the response to the beer has been better than we ever imagined. 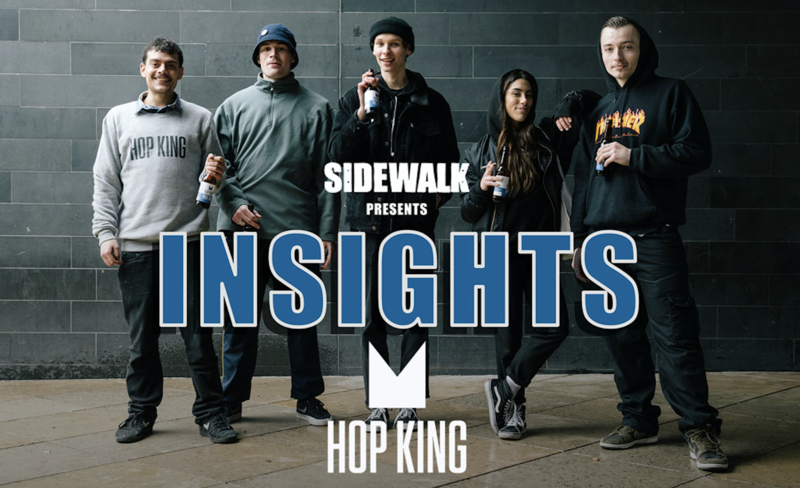 The beer, however, is just one aspect of Hop King and and my brother, Ludi, and I were busy behind the scenes trying to create the Hop King Lifestyle….